In this study, we investigated possible aberrations of monocytes from patients with primary Sjögren's syndrome (pSS). We focused on B-cell-activating factor of the TNF family (BAFF) and IL-6 because they are both produced by monocytes and are known to be involved in the pathogenesis of pSS. Peripheral monocytes were prepared from both pSS patients and normal individuals. The cells were stimulated in vitro with IFN-γ, and the amounts of IL-6 and soluble BAFF (sBAFF) produced by the cells were quantitated. The effect of sBAFF itself on the production of IL-6 was also studied. To investigate the response of pSS monocytes to these stimuli, the expression levels of the genes encoding BAFF receptors and IL-6-regulating transcription factors were quantitated. Peripheral pSS monocytes produced significantly higher amounts of sBAFF and IL-6 than normal monocytes did, even in the absence of stimulation. The production of these cytokines was significantly increased upon stimulation with IFN-γ. The elevated production of IL-6 was significantly suppressed by an anti-BAFF antibody. In addition, stimulation of pSS monocytes with sBAFF induced a significant increase in IL-6 production. Moreover, the expression levels of a BAFF receptor and transcription factors regulating IL-6 were significantly elevated in pSS monocytes compared to normal monocytes. The results of the present study suggest that the mechanisms underlying the production of sBAFF and IL-6 are impaired in pSS monocytes. Our research implies that this impairment is due to abnormally overexpressed IL-6-regulating transcription factors and a BAFF receptor. These abnormalities may cause the development of pSS. Sjögren's syndrome (SS) is an autoimmune disease which primarily affects the salivary and lachrymal glands. Major clinical manifestations of primary SS (pSS) are xerostomia and keratoconjunctive sicca, which are consequences of lesions of the salivary glands and lachrymal glands, respectively. Accumulating evidence suggests that lymphocytic infiltrate of exocrine glands plays a key role in lesion formation and the subsequent dysfunction of the glands . B-cell-activating factor of the TNF family (BAFF) (tumor necrosis factor ligand superfamily, member 13b) is a cytokine which is primarily produced by monocytes and dendritic cells [2–4] in addition to T cells [5, 6]. It plays a crucial role in the proliferation, differentiation and survival of B cells [2, 4, 5, 7]. BAFF is a type II membrane-bound protein of 285 amino acid residues. A C-terminal fragment of 152 amino acid residues is released from cells as soluble BAFF (sBAFF) . sBAFF binds to its receptors (that is, transmembrane activator and calcium modulator and cyclophilin ligand interactor (TACI), B cell maturation antigen (BCMA) and B cell activating factor receptor (BAFF-R) [8–14]), possibly as a trimer [8, 11, 13], and elicits signal transduction through several pathways [10, 11, 13, 15, 16]. It is noteworthy that transgenic mice that overexpress BAFF in lymphoid cells develop hyperplasia of mature B cells [8, 17, 18] or pSS-like pathology . BAFF is also elevated in the serum of pSS patients [20, 21] and strongly expressed in the lymphocytes infiltrating the salivary glands [22, 23]. Moreover, elevated production of BAFF has been linked to the development of another autoimmune disease, systemic lupus erythematosus [24–26]. Notably, systemic and/or local concentrations of several other cytokines, such as IL-6, are also significantly elevated in pSS patients compared to normal individuals [27, 28]. IL-6 promotes the differentiation of B cells , which play a pivotal role in the production of autoantibodies and hence in the development of pSS. Since monocytes produce both IL-6  and BAFF [2, 4, 31], we hypothesized that the production of these cytokines is dysregulated in pSS monocytes. If that is the case, aberrations of pSS monocytes may be implicated in the abnormal production of autoreactive immunoglobulin G (IgG) by B cells, which is involved in the pathogenesis of autoimmune diseases such as pSS . In the present study, we demonstrate that the regulatory mechanisms for the production of these cytokines are impaired in pSS monocytes. Venous blood samples were collected from pSS patients (n = 13 females ages 32 to 64 years (average age = 50.5)) and normal individuals (n = 12 females ages 26 to 60 years (average age = 43.5)) after receiving their informed consent. Patients fulfilled the American-European Consensus Group criteria for pSS . At the time of the collection of blood samples, two patients (15.4%) were receiving prednisolone at a daily dose < 5 mg. The remaining patients were free of medication. This study was approved by the ethics committees at Keio University School of Medicine and Saitama Medical University. Peripheral monocytes were isolated as follows: Whole blood was mixed with RosetteSep Human Monocyte Enrichment Cocktail (StemCell Technologies, Vancouver, BC, Canada) and centrifuged over Ficoll-Hypaque (Beckman Coulter, Fullerton, CA, USA). A monocyte-enriched fraction was collected and cultured overnight in RPMI 1640 (American Tissue Culture Collection, Manassas, VA, USA) supplemented with 10% FCS in a humidified incubator (7% CO2) at 37°C so that the expression of various stress-induced genes subsided. The cells were then washed once with the medium to remove debris. Fluorescence-activated cell sorting (FACS) analysis of the cells demonstrated that > 96% of the living cells were CD14-positive. The monocytes were cultured in the absence or presence of various concentrations of IFN-γ or sBAFF, and the cumulative production of sBAFF and/or IL-6 was examined by ELISA. The production was dependent on the incubation period. The optimal incubation period was found to be 96 hours. The production of the cytokines increased almost in proportion to the concentration of stimuli up to 200 ng/ml IFN-γ or 2 μg/ml sBAFF. An anti-BAFF mAb for ELISA was prepared in our laboratory . A rabbit polyclonal anti-BAFF antibody and recombinant human sBAFF were purchased from Chemicon International (Temecula, CA, USA). Recombinant human IFN-γ, a control mouse IgG1, and mAbs for measurement of the amount of IL-6 by ELISA (MQ2-13A5 and MQ2-39C3 for capture and detection, respectively) and for FACS analysis (CD4-APC (RPA-T4) for T cells, CD14-PE-Cy7 (M5E2) for monocytes, CD20-APC-Cy7 (L27) for B cells and CD268-FITC (11C1) for BAFF-R) were purchased from BD Biosciences/Pharmingen (San Diego, CA, USA). An anti-TACI antibody for FACS analysis (CD267-PE (FAB1741P)) was purchased from R&D Systems (Minneapolis, MN, USA). Monocytes were cultured at 2.5 × 105/ml for 96 hours in a 24-well plate (2 ml/well) in the presence of stimuli (that is, recombinant human IFN-γ or recombinant human sBAFF). The amounts of sBAFF (in response to IFN-γ as a stimulus) and IL-6 (in response to IFN-γ or sBAFF as stimuli) in the culture supernatants were measured by sandwich ELISA according to previously described methods , except for the concentrations of capture and detection antibodies for IL-6, which were prepared at 0.5 μg/ml. For quantitation of sBAFF, we used our own anti-BAFF mAb, which specifically detects sBAFF and does not react with a proliferation-inducing ligand (APRIL) . In our hands, the sensitivity of our ELISA system was better than that of commercially available ELISA kits (R&D Systems) in the range of 0.4 to 100 ng/ml sBAFF (data not shown). The expression levels of BAFF, BAFF-R, TACI, NF-IL6, NF-IL6β, NF-κB1, NF-κB2 and glyceraldehyde 3-phosphate dehydrogenase (GAPDH) were quantitated by using a method described previously . The following oligonucleotides were used as primers for PCR: 5'-ggaatctctgatgccacagctc and 5'-accttcaagggctgtcaaagatg (BAFF-R); 5'-agcatcctgagtaatgagtggcc and 5'-gagcttgttctcacagaagtatgc (TACI); 5'-aaaactttggcactggggcacttg and 5'-catctttaagcgattactcagggc (NF-IL6); 5'-agatgcagcagaagttggtggag and 5'-tagcttctctcgcagtttagtgg (NF-IL6β); 5'-atgggatctgcactgtaactgc and 5'-tcatagatggcgtctgataccacg (NF-κB1); 5'-cctgactttgagggactgtatcca and 5'-gcagcatttagcagcaaggtcttc (NF-κB2). Primer sets for BAFF and GAPDH were designed as described previously . The expression level of each gene underwent dual normalization against GAPDH expression and expression of the same gene in unstimulated normal monocytes. FACS and data analyses were carried out on a MACSQuant Analyzer (Miltenyi Biotec, Bergisch Gladbach, Germany). FACS analysis of cells in whole blood was carried out according to methods recommended by the manufacturer of the antibodies (BD Biosciences/Pharmingen). Differences between groups were examined for statistical significance by using the two-tailed Student's t-test for single comparisons. Two-way analysis of variance (ANOVA) was also employed when appropriate. A P value less than 0.05 denoted the presence of a statistically significant difference. Peripheral monocytes were prepared from primary pSS patients and normal individuals. The clinical characteristics of the pSS patients involved in this study are listed in Table 1. The cells were cultured for 96 hours in the absence or presence of IFN-γ (200 ng/ml), which is known to activate monocytes  and upregulate the expression of BAFF . Stimulation of the cells was confirmed by the induction of interferon-gamma inducible protein 10 (data not shown). pSS monocytes released a significantly higher amount of sBAFF (5.4 ± 0.8 ng/ml) into the culture media than normal monocytes did (1.6 ± 0.3 ng/ml), even in the absence of stimulation, suggesting dysregulated production of sBAFF in pSS monocytes (Figure 1A, "Normal -" and "pSS -"). 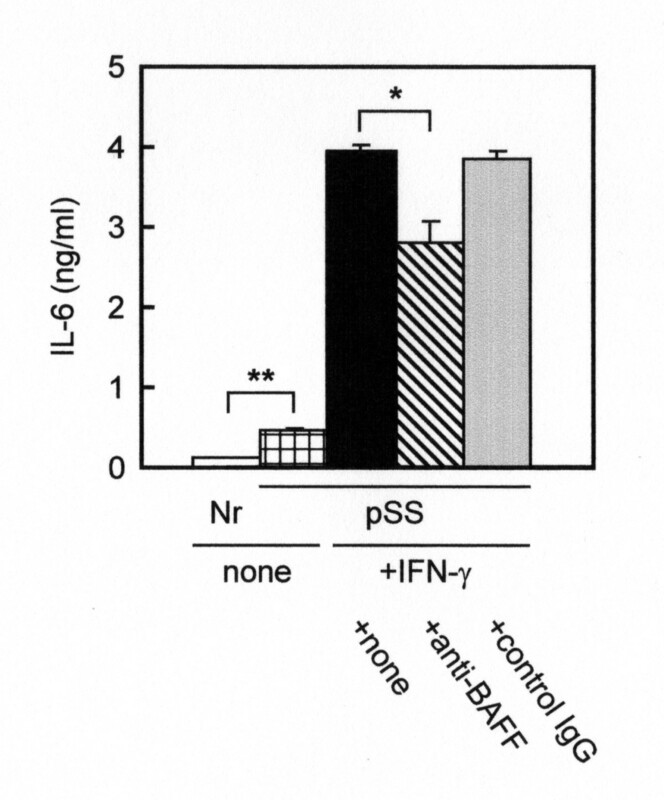 IFN-γ stimulation (Figure 1A, "Normal +" and "pSS +") resulted in an increase in sBAFF in both normal (6.6 ± 1.6 ng/ml) and pSS monocytes (21.1 ± 2.1 ng/ml). Production of sBAFF by peripheral monocytes. Monocytes (2.5 × 105/ml) were cultured for 96 hours in the absence (-) or presence (+) of recombinant human IFN-γ (200 ng/ml). (A) The amounts of soluble B-cell-activating factor of the TNF family (sBAFF) in the culture supernatants of normal individuals (open circles) and primary Sjögren's syndrome (pSS) patients (closed circles) were quantitated in triplicate measurements by sandwich ELISA. Bars indicate means. **P < 0.01 and ***P < 0.001. (B) Total RNAs were prepared from normal and pSS monocytes and subjected to RT-PCR for BAFF and glyceraldehyde 3-phosphate dehydrogenase (GAPDH). Representative data are shown. 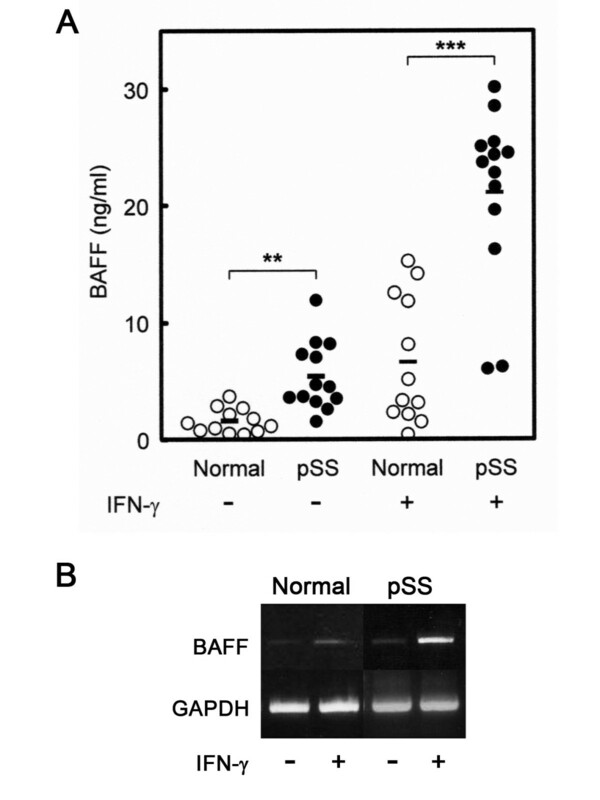 RT-PCR analysis indicated that the expression of the BAFF gene in pSS monocytes was distinctly elevated upon stimulation with IFN-γ (Figure 1B). Quantitative RT-PCR analysis indicated that the relative expression level of the BAFF gene was about three times higher in pSS monocytes than in normal monocytes under unstimulated conditions. The expression levels increased about sixfold in both normal and pSS monocytes upon stimulation with IFN-γ. These data are basically consistent with the results derived by ELISA. Therefore, we postulated that the elevated production of sBAFF was the consequence of the enhanced expression of the BAFF gene. We also investigated whether the production of IL-6 by pSS monocytes was abnormal. As indicated in Figure 2, pSS monocytes produced significantly higher amounts of IL-6 than normal monocytes without stimulation (Figure 2, open column vs checkerboard column; P < 0.01). Stimulation of pSS monocytes with 200 ng/ml IFN-γ induced a striking increase (8.6-fold; P < 0.001) in IL-6 production (Figure 2, checkerboard column vs closed column). Since IFN-γ induced the expression of BAFF (Figure 1) and BAFF is able to activate monocytes [35, 36], these results suggest that BAFF produced by monocytes may act in an autocrine fashion to augment the expression of IL-6. To test this hypothesis, we stimulated pSS monocytes with IFN-γ in the presence of an anti-BAFF mAb . Interestingly, the mAb suppressed IL-6 production in part, but significantly so (P < 0.05) (Figure 2, closed column vs hatched column, whereas a control antibody had no effect (Figure 2, closed column vs gray column). These results suggest that the signal transduction pathway mediated by BAFF is implicated in the regulation of IL-6 production by IFN-γ-primed monocytes. Production of IL-6 by peripheral monocytes stimulated with IFN-γ. Monocytes (2.5 × 105/ml) prepared from normal individuals (Nr) (open column) and primary Sjögren's syndrome (pSS) patients (checkerboard column) were cultured for 96 hours without stimulation. pSS monocytes were similarly cultured in the presence of 200 ng/ml of recombinant human IFN-γ (closed, hatched and gray columns), and simultaneously exposed to none (closed column), an anti-BAFF antibody (10 μg/ml; hatched column) or a control IgG (10 μg/ml; gray column). The amounts of IL-6 in the culture supernatants were measured by sandwich ELISA. BAFF = B-cell-activating factor of the TNF family; IgG = immunoglobulin G. Data represent means ± SEM. *P < 0.05 and **P < 0.01. If this is really the case, then exogenously supplemented sBAFF should affect the production of IL-6 by monocytes. As expected, recombinant human sBAFF induced the production of IL-6 by both normal (Figure 3, closed circles) and pSS (Figure 3, open circles) monocytes in a dose-dependent manner. 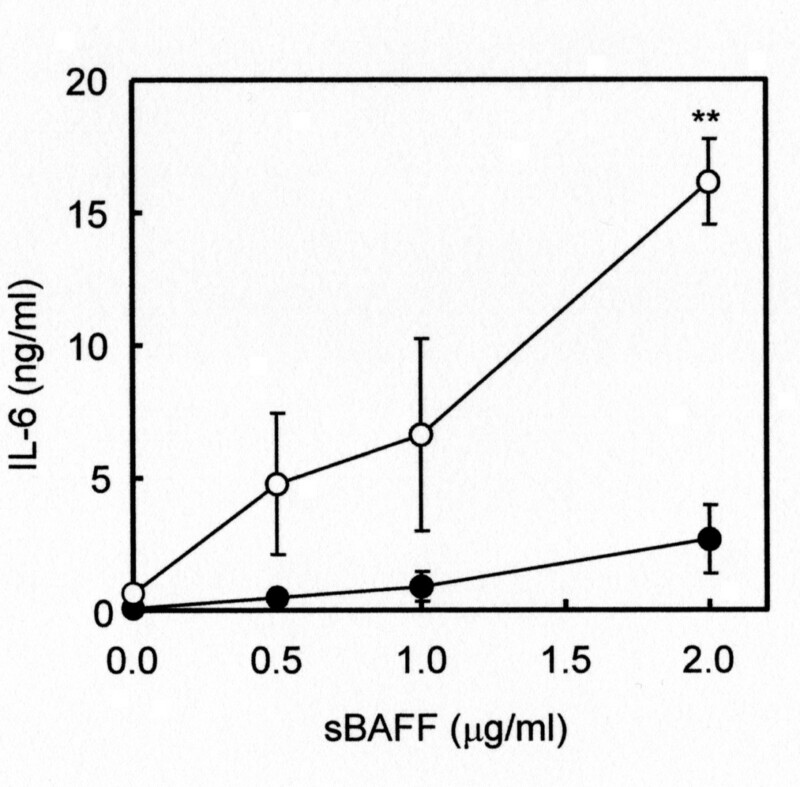 pSS monocytes produced approximately six times more abundant IL-6 than normal monocytes in the presence of 2 μg/ml sBAFF (Figure 3). It should be noted that two-way ANOVA revealed that disease status (normal or pSS) had significantly stronger effects than stimulation with sBAFF (P < 0.001 for cell type × stimulation interaction) on IL-6 production by monocytes. Production of IL-6 by peripheral monocytes stimulated with sBAFF. Monocytes (2.5 × 105/ml) prepared from normal individuals (closed circles) and primary Sjögren's syndrome (pSS) patients (open circles) were cultured for 96 hours in the presence of 0, 0.5, 1.0 and 2.0 μg/ml of recombinant human soluble B-cell-activating factor of the TNF family (sBAFF). The amounts of IL-6 in the culture supernatants were measured by sandwich ELISA. Data represent means ± SEM. **P < 0.01. A 2,3-bis-(2-methoxy-4-nitro-5-sulfophenyl)-2H-tetrazolium-5-carboxanilide (XTT) assay in a separate experiment indicated that 2 μg/ml sBAFF supported the survival of both normal and pSS monocytes during the culture period. However, there was no significant difference in survival rates between normal and pSS monocytes (data not shown), suggesting that higher production of IL-6 was not simply a consequence of enhanced survival of monocytes. These data suggest that the regulatory mechanism for IL-6 production is aberrant in pSS monocytes. Although it has been reported that BAFF receptors are mainly expressed in lymphocytes , our results suggest that BAFF receptors are also expressed in monocytes. RT-PCR detected mRNA for BAFF-R in monocytes. Notably, the expression level of BAFF-R was significantly elevated in pSS monocytes (2.1-fold; P < 0.001) compared to normal monocytes (Table 2). In accordance with these data, FACS analysis indicated that approximately 60% of pSS monocytes were BAFF-R-positive (mean fluorescence intensity (MFI) = 50), whereas only about 25% of normal monocytes were positive to the same antibody (MFI = 20) (Figure 4A). 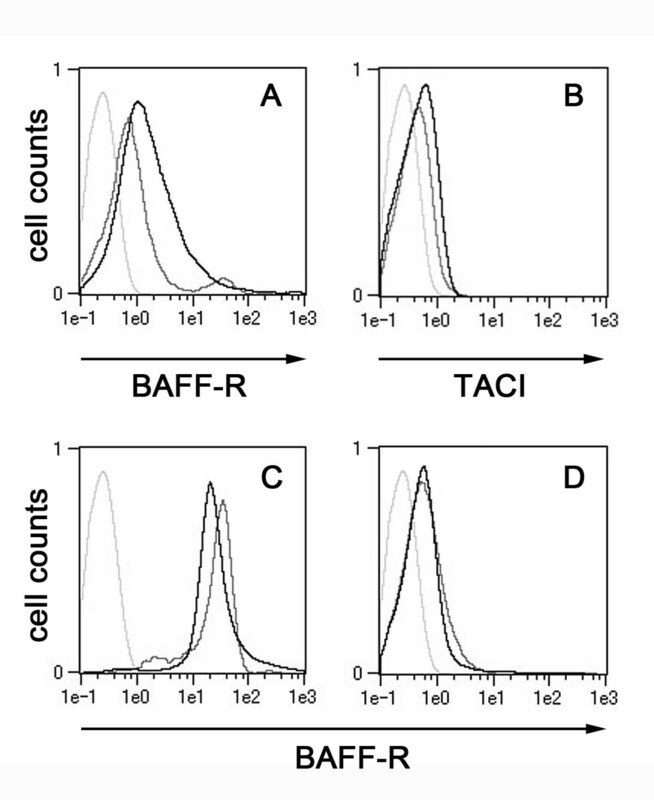 The proportion of TACI-positive monocytes was relatively low compared to BAFF-R-positive cells (Figure 4B). Although the population of TACI-positive monocytes seemed to increase slightly in pSS compared to control monocytes (Figure 4B), the expression level of the TACI gene was not significantly increased (Table 2). BAFF = B-cell-activating factor of the TNF family; pSS = primary Sjögren's syndrome; TACI = transmembrane activator and calcium-modulator and cyclophilin ligand interactor. Monocytes (2.5 × 105/ml) prepared from normal individuals ("Normal") and pSS patients ("pSS") were cultured for 96 hours without stimulation. Total RNAs were extracted from the cells, and the expression levels of TACI and BAFF-R were quantitated. The relative expression levels of the genes are indicated. Data represent means ± SEM. Asterisk denotes statistically significant difference between "Normal" and "pSS." ***P < 0.001. Fluorescence-activated cell sorting analysis of monocytes and lymphocytes. (A) and (B) Normal (gray line) and primary Sjögren's syndrome (pSS) (black line) monocytes were cultured for 96 hours without stimulation, and CD14+/BAFF-R+ cells (A) and CD14+/TACI+ cells (B) were examined by fluorescence-activated cell sorting (FACS) analysis. (C) and (D) Lymphocytes in whole blood samples of a normal individual (gray line) and a pSS patient (black line) were examined by FACS analysis for CD20+/BAFF-R+ cells (B cells in part (C)) and CD4+/BAFF-R+ cells (T cells in part (D)). Light gray lines represent isotype controls. Representative data derived by FACS analysis are shown. BAFF-R = B cell activating factor receptor; TACI = transmembrane activator and calcium modulator and cyclophilin ligand interactor. FACS analysis of lymphocytes in whole blood indicated that there were no significant differences between pSS patients and normal individuals in the population of BAFF-R-positive B and T cells (Figures 4C and 4D). All these data suggest that the expression of BAFF-R is dysregulated in pSS monocytes and that this dysregulation seems to be specific to monocytes among the cells examined thus far. In an attempt to elucidate a possible mechanism of sBAFF-mediated overproduction of IL-6 by pSS monocytes, we investigated the expression levels of transcription factors involved in the expression of the IL-6 gene (that is, NF-IL6 (CCAAT/enhancer-binding protein β), NF-IL6β (CCAAT/enhancer-binding protein δ), NF-κB1 and NF-κB2). The relative expression levels of all the transcription factors were significantly elevated in pSS monocytes compared with the control (Table 3). Remarkably, the relative expression level of NF-IL6 was more than six times higher in pSS monocytes than in normal monocytes. These data indicate that the expression of IL-6-regulating transcription factors was abnormally upregulated in pSS monocytes. pSS = primary Sjögren's syndrome. Total RNAs were extracted from monocytes prepared as described in the Table 2 footnote, and the expression levels of NF-IL6, NF-IL6β, NF-κB1 and NF-κB2 were quantitated. The relative expression levels of the genes are indicated. Data represent means ± SEM. Asterisk denotes statistically significant difference between "Normal" and "pSS." *P < 0.05 and ***P < 0.001. Several lines of circumstantial evidence have suggested that BAFF and IL-6 are implicated in the development of primary pSS [19–23, 27, 28, 38]. In addition, these cytokines are produced by monocytes [2, 4, 39, 40]. These findings prompted us to investigate the possibility of aberrations in the monocytes of pSS patients. We hypothesized that the production of these cytokines is dysregulated in pSS monocytes. To address this issue, we examined the production of these cytokines by peripheral pSS monocytes in vitro in response to IFN-γ, a cytokine known to upregulate BAFF expression [2, 41]. As expected, pSS monocytes produced a higher amount of sBAFF than normal monocytes, even in the absence of stimulation (Figure 1A). IFN-γ also induced the production of IL-6 by pSS monocytes. Interestingly, the induction was suppressed in part, but significantly, by an anti-BAFF antibody (Figure 2). In addition, exogenously supplemented sBAFF induced a striking increase in the production of IL-6 by pSS monocytes (Figure 3), whereas exogenously supplemented IL-6 had no effects on the production of sBAFF by the cells (data not shown). These data, together with the results shown in Figure 1A, collectively imply that BAFF produced by monocytes act in an autocrine fashion and that signal transduction pathways mediated by BAFF are likely involved in the regulation of IL-6 production by monocytes. Notably, two-way ANOVA indicated that pSS monocytes were more susceptible than normal monocytes to stimulation by sBAFF. This increased susceptibility may be due to an exaggeration of signals in pSS monocytes triggered by sBAFF. BAFF is known to bind to several receptors, such as TACI, BAFF-R and BCMA [8, 10, 11, 13]. BAFF binds TACI  and BAFF-R [43, 44] with high affinity, whereas the binding affinity of BAFF to BCMA is very low [44, 45]. We found that a relatively small population of normal monocytes was TACI-positive (Figure 4B) and that the expression level of TACI did not increase in pSS patients (Table 2). Interestingly, expression of BAFF-R, a BAFF-specific receptor, was significantly elevated in pSS monocytes compared to the control (Table 2). FACS analysis suggested that this elevation may be the consequence of an increase not only in the population of BAFF-R-positive cells but also in the expression of the BAFF-R gene in individual pSS monocytes (Figure 4A). Considering all of this information together, we believe that abnormally overexpressed BAFF-R may have contributed to the enhanced production of IL-6 by pSS monocytes upon stimulation with sBAFF (Figure 3). The increase in the population of BAFF-R-positive cells was specific to pSS monocytes among the cells examined thus far, and no significant differences were observed in the population of BAFF-R-positive lymphocytes between pSS and the normal control (Figures 4C and 4D). To shed light on the aberrant production of IL-6 by pSS monocytes, we examined the expression levels of several transcription factors involved in the expression of IL-6. Interestingly, the expression levels of all the transcription factors examined in the present study were significantly elevated compared to normal monocytes (Table 3). The expression of these transcription factors was generally constitutive and insensitive to stimulation, in particular with regard to sBAFF (data not shown). The expression level of NF-IL6 was especially high among the transcription factors examined. The higher expression of these factors may have amplified a signal triggered by sBAFF which resulted in overproduction of IL-6 by pSS monocytes. On the basis of the results shown in Figure 2 andTable 3 we suppose that IFN-γ induces the production of IL-6 in pSS monocytes through at least two distinct pathways: one is direct activation of the IL-6 gene and the other is indirect activation of the gene mediated by sBAFF. The relationship between the aberration of pSS monocytes and the clinical manifestations of the disease remains unclear. There was no significant correlation between the presence of rheumatoid factor, anti-SSA/Ro or anti-SSB/La in pSS patients and the amounts of IL-6 and sBAFF produced by pSS monocytes. However, dendritic cells have been observed in the salivary glands of pSS patients [46–48], and peripheral monocytes can migrate to the salivary glands and develop into dendritic cells [49–51]. In addition, the local concentration of IFN-γ in the salivary glands of pSS patients seems to be increased because of T cells' infiltrating the tissue [51, 52]. Therefore, we hypothesize that monocyte-derived dendritic cells infiltrating the salivary glands of pSS patients are stimulated by IFN-γ to produce excessive amounts of BAFF and IL-6. Although the number of the patients involved in the current study was small, the data strongly suggest that monocytes of pSS patients are abnormally activated. We hypothesize that stimulation of pSS monocytes by IFN-γ is partly mediated by BAFF as a result of the abnormal overexpression of BAFF-R and that the signals are amplified by abnormal overexpression of transcription factors that regulate IL-6 production. We speculate that these aberrations may underlie the pathogenesis of pSS. We thank Dr Makoto Yoshimoto for his help in the preparation of this manuscript. This study was supported in part by a Grant-in-Aid for Scientific Research from the Ministry of Education, Culture, Sports, Science and Technology of Japan (20591193). KY and TT were responsible for the study design; the acquisition, analysis and interpretation of data; and manuscript preparation. MT, YS and MK contributed to the acquisition, analysis and interpretation of data. HK, KS, KeT, YO and KaT participated in the enrollment of patients into the study and assisted in the acquisition and interpretation of data. TA was involved in data interpretation and manuscript preparation. All authors read and approved the final manuscript for publication.